Located in the far northwestern corner of Surin province, the tiny village of Baan Ta Klang was historically home to a small ethnic group known as the Kui, who were employed by Ayutthaya kings thanks to their skills at capturing and taming wild elephants. Browse places to stay in Surin on Agoda.com. Free cancellation. Their legacy lives on in what is now one of Thailand’s largest elephant centres. In the village you’ll find a large elephant training area, a museum and the Surin Elephants Study Centre. Visitors have the opportunity to feed, bathe and ride elephants, or just watch and photograph them being trained. There’s also an elephant show held on most days at 10:00 and 14:00, featuring the usual circus tricks. Many of the elephants that perform as part of the yearly Elephant Festival in Surin town are trained in Baan Ta Klang. The museum features an ancient elephant skeleton along with examples of tools used traditionally by the Kui to capture and handle elephants. A great deal of information on the Kui people, the history of elephants in Thailand, and the biology and prehistory of elephants is provided in English. The study centre undertakes research while also caring for sick and old animals. Many of the elephants that end up in tourist "elephant camps" around the country are originally from Baan Ta Klang and other parts of Surin province. The local government has an ongoing policy that attempts to "bring the mahouts and elephants back to their hometown", and they hope to become the "largest village of elephants in the world". If you’re concerned about the ethical issues of elephant tourist attractions, as we are, you may need to think about whether a visit to Baan Ta Klang is the right thing to do. Our impression was that the animals are treated better than at many elephant camps, but Baan Ta Klang is not as "elephriendly" as true elephant sanctuaries like Elephant’s World in Kanchaburi or the Elephant Nature Park in Chiang Mai. The people at Elephant’s World claim that adult humans riding elephants anywhere but on their strong necks is cruel and inhumane, which would make virtually all elephant riding and trekking unethical (as a rule, we no longer ride elephants). Many also feel that training elephants to perform "circus tricks" -- like what you’d see at the Surin Elephant Festival -- can also be cruel. Both of these practices do take place at Baan Ta Klang. 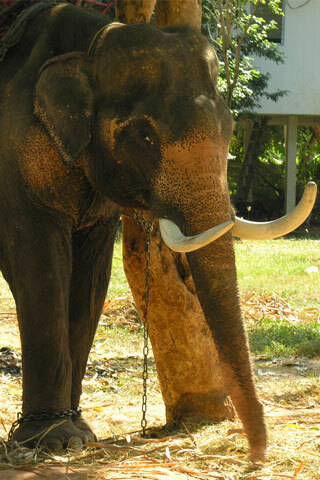 We also noticed a few elephants chained to posts during our visit, which you don’t often see at elephant sanctuaries. On the other hand, Baan Ta Klang has centuries of history with pachyderms. The special relationship between mahout and elephant is perhaps best witnessed in a place where elephant training has been a way of life going back many generations. The on-site study centre also does some good work, so we’d conclude that Baan Ta Klang is something of a mixed bag from an ethical standpoint. Admission to the elephant centre is 50 baht per person. Baan Ta Klang is 58 kilometres north of Surin on Route 214 (the road to Roi Et). Songthaews depart regularly from the bus station; we were quoted 60 baht per person. It's a manageable motorbike ride if you want to go on your own. Head north on Route 214 and take a left, following clearly marked blue signs the whole way (if you reach Tha Tum village you've gone too far). Once in Baan Ta Klang, take a left right after Ta Klang school and you'll see the elephants straight ahead.